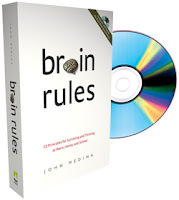 I'm over at 5 Minutes for Books today talking about Brain Rules which, I have to say, I really, really liked. I'd really like to know what you think about it if you get a chance to read it. P.S. This book was (and is!) right up my alley and is prompting all sorts of thoughts and arguments. Take a peek at the review and follow the comment trail. This is a great example of what books are supposed to make you do -- THINK!